While the actual Coronation Night of Binibining Pilipinas 1969 was held June 13 of that year, 2019 marks the Golden Anniversary of Gloria Diaz – both as Binibining Pilipinas Universe and (our country’s first) Miss Universe. Let us focus on her conquest of the national pageant. Let us now look back at nostalgic photos which the great pageant collector Townee F Paat graciously shared with your blogger for this intent – from her graduation photo in the St. Scholastica College Yearbook at age 17 to her participation in Bb. Pilipinas 1969 at age 18 and eventually winning the right to represent the country in Miss Universe 1969. Posted in: 1 Pageant Pages, 2 Shout-out-Looks, 5 TV Tales. 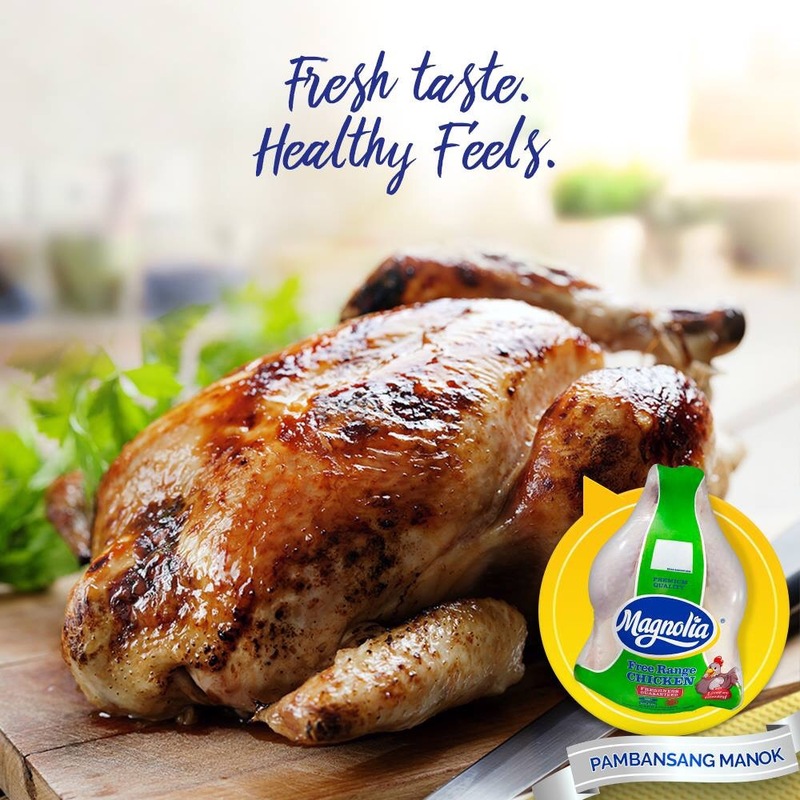 Tagged: Gloria Diaz, Magnolia Chicken, Margarita Moran, Pambansang Manok, Pia Alonzo Wurtzbach, PublicisJimenezBasic. 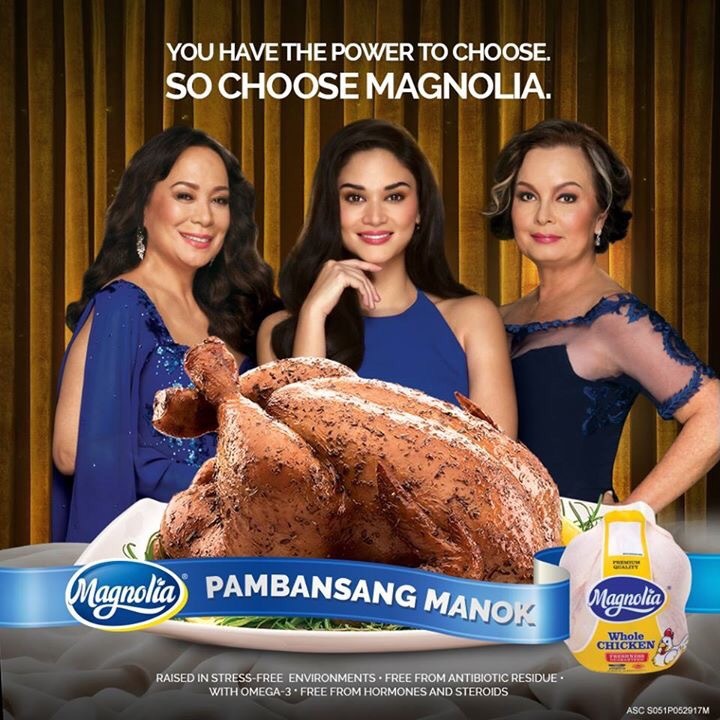 Magnolia Chicken has achieved a casting coup of sorts by assembling the Philippines’ three Miss Universe titleholders – Gloria Diaz (1969), Margarita Moran (1973) and Pia Wurtzbach (2015) – in its latest TV commercial which christened their brand of fowl as “Pambansang Manok” (National Chicken) in the process. I like it that the ad agency (PublicisJimenezBasic) behind the TVC was able to bring the concept to fruition as getting all three winners in one ad campaign is an idea waiting to be picked up since Pia won. Maybe the right brand is just waiting to be tapped for all three to appear in. Posted in: 1 Pageant Pages, 2 Shout-out-Looks. Tagged: 65th Miss Universe, Gloria Diaz, Margarita Moran, Okada Manila, Pia Wurtzbach, PLDT, Sila Çakir, Smart, SMX Convention Center. 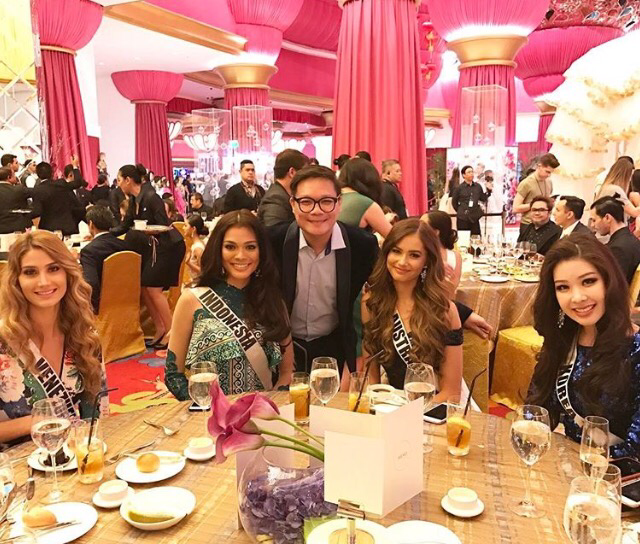 Earlier at the SMX Convention Center, PLDT and Smart Communications hosted a lunch for the media and twenty of the 65th Miss Universe candidates. It was hashtagged #PLDTMissU #SmartMissU #keepthecrown and the members of the Press had a grand time talking to and having photos taken with the candidates. And they even joined us for lunch in our respective tables. We had Misses Turkey, Great Britain, Russia and Colombia with us. I really started bonding well with the uber beautiful Sila Çakir with whom I shared tips on how she should handle the Preliminary Interviews which will start soon. I also had good conversations with Jaime-lee Faulkner, Yuliana Kolorkova and Andrea Tovar (who is less of a diva and more of a warm and “gayish” persona). 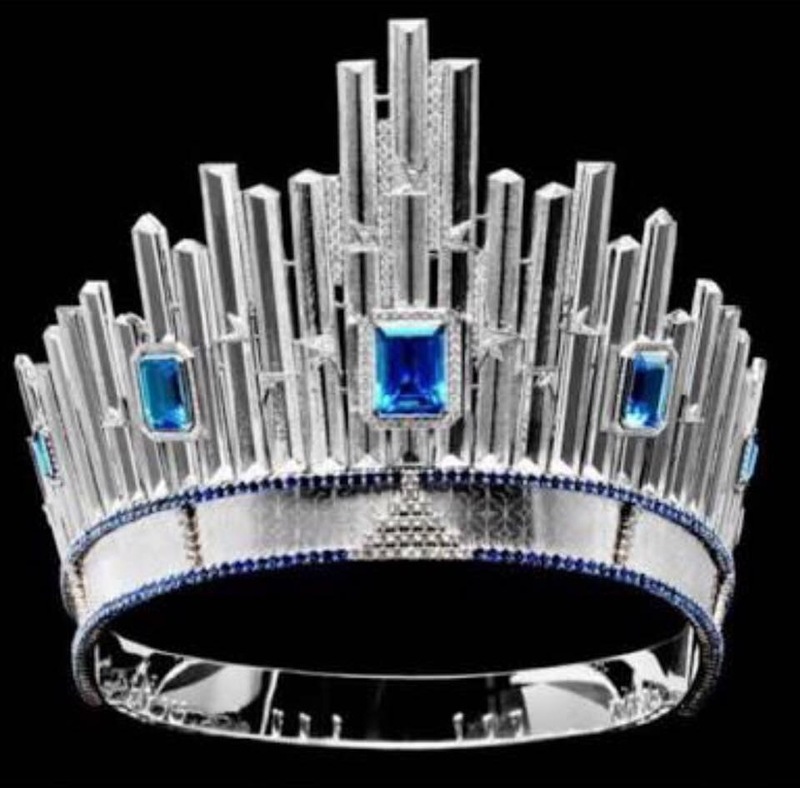 What made the event sweet was your blogger winning a Miss Universe replica crown in an Instagram-related contest where the winners will be selected based on the photo/s uploaded of the gathering on Instagram. 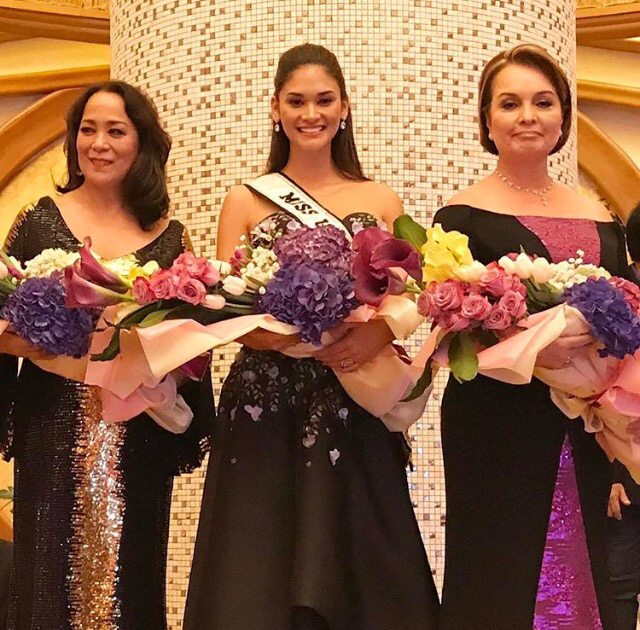 And tonight at Okada Manila, a dinner reception was hosted by the casino resort for all the contestants where the highlight is the presence of the Philippines’ three Miss Universe winners – Gloria Diaz (1969), Margarita Moran (1973) and Pia Alonzo Wurtzbach (2015). This was such an emotional sight for everyone, especially the Filipinos in the audience who were so awestruck when the trio went up the stage for photos and all. This is such a long and tiring day for everyone. And tomorrow’s schedule is mercifully less toxic. The Tribute to Miss Universe Pia Alonzo Wurtzbach will happen in the evening at the Harbor Tent of Sofitel Manila. And I can’t wait to attend that one! Posted in: 1 Pageant Pages, 2 Shout-out-Looks. Tagged: Gloria Diaz, Margarita Moran, Miss Universe, Pia Alonzo Wurtzbach. 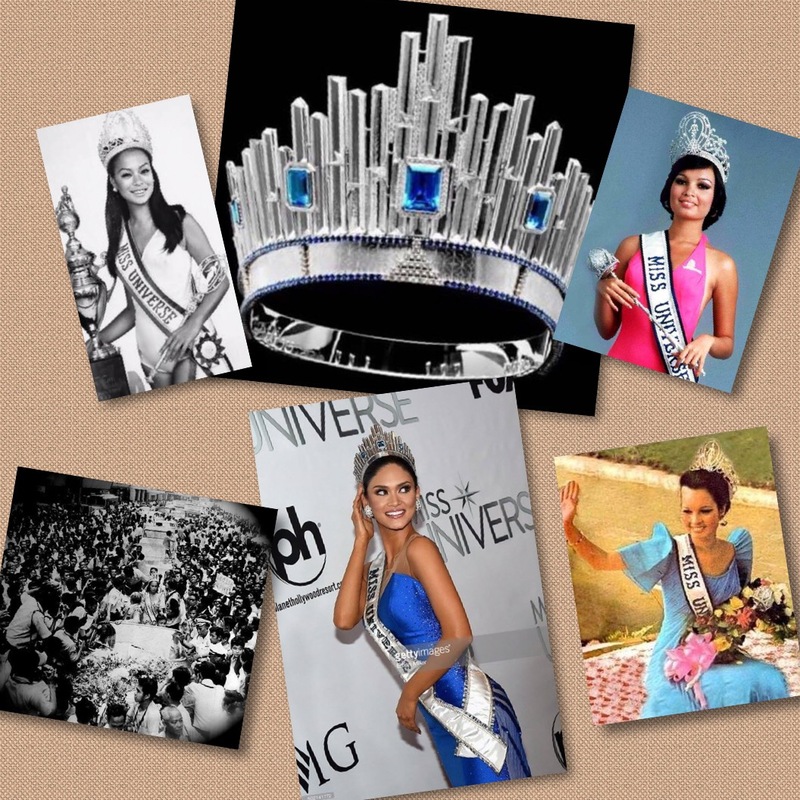 There is no significant trivial information to support the achievement of the Philippines winning the Miss Universe crown during the years 1969, 1973 and 2015. Considering the time intervals, any pageant expert already following then would initially surmise that after clinching our first two victories in a span of just five years would mean constant wins or top placements through four different decades of participation. Not so. We also had our share of dark ages (no Top 5 at all) scattered in between, the longest stretches of drought running from 1952 to 1962 going next from 1985 to 1993, and then from 2000 to 2009. These are the time clusters when all we can do is sit and take one disappointment after the other, hoping that succeeding editions would be kinder to our delegates. Of course, we should be happy that our record in the annual beauty competition is nothing to sneer at. If at any, consider ourselves lucky that we have really made our presence felt, unlike some nations which cannot enumerate a list of crowning glories, let alone runner-up finishes or even Top 10 inclusions. At this point, we are already considered a pageant powerhouse nation, not only in Miss Universe but other fronts as well. How will the Grand Homecoming of Miss Universe 2015 unravel? Posted in: 1 Pageant Pages, 2 Shout-out-Looks. Tagged: Gloria Diaz, Margarita Moran, Miss Universe 1969, Miss Universe 1973, Miss Universe 2015, Pia Alonzo Wurtzbach. Back in 1969 and 1973 when the Philippines experienced its first two tastes of Miss Universe glory, both Gloria Diaz and Margarita Moran were welcomed back to the country with such funfare that their respective parades (while seated on a top down car) around Manila were attended by so many proudly cheering Filipinos showing their joy in seeing a Filipina being crowned the most beautiful in the universe. The arrangements were not yet as complex back then – with no lockdowns from the organizers and uber restrictions on protocol and how the homecoming proceeded from Day 1. Their schedules were not clamped down in terms of how long they can stay in the country or how soon they need to go back to the home base in the US. 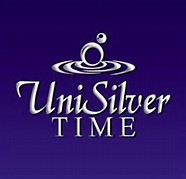 Nowadays, becoming Miss Universe means chasing time. The upcoming arrival of Miss Universe 2015 Pia Alonzo Wurtzbach in the country was scheduled to jibe with a MUO-committed annual visit to Djakarta where she will crown the winner of Puteri Indonesia 2016. This is the reason why she will be flying in from the Indonesian capital on January 23, and not New York City. And it’s not like she will be given enough “me” time in Manila. With all the scheduled Press Conferences, ticker tape parade, Malacañan Palace courtesy call and countless appearances and reception, it’s good that she was able to negotiate for an extra few days so that she can settle personal items like her rented apartment, personal effects and a previously-agreed date to attend the wedding of her best friend (actress) Pauleen Luna to actor/comedian Vic Sotto. Posted in: 1 Pageant Pages, 2 Shout-out-Looks. 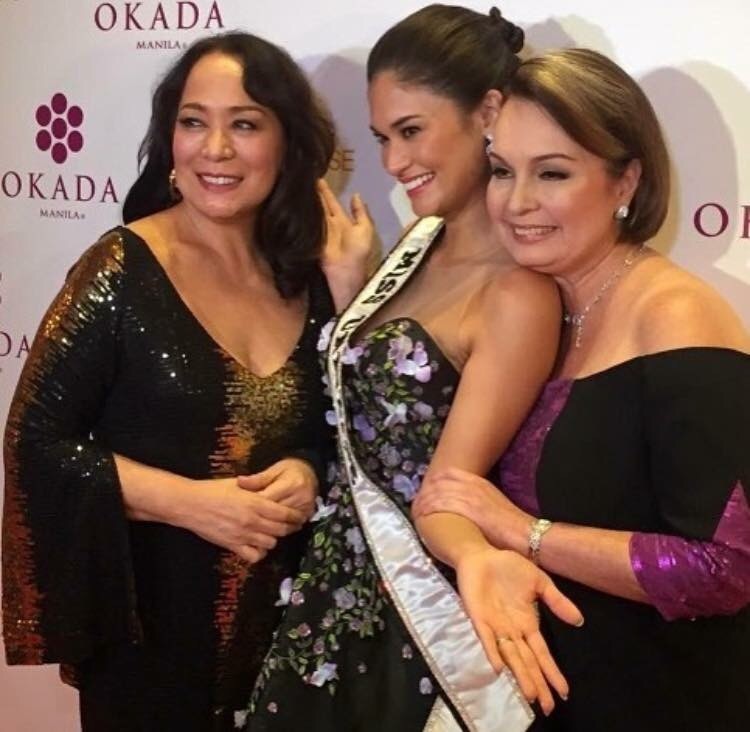 Tagged: Gloria Diaz, Margarita Moran, Miss Universe 2015, Pia Alonzo Wurtzbach. Call it fate. Call it a most controversial turn of winning moments. Call it whatever you like. The essence of Miss Universe is who rightfully won the DIC crown. Ariadna Gutierrez of Colombia had her brief shining moment. But it wasn’t meant to last because in less than 5 minutes, the real winner was announced and the crown transferred ownership in a flash. Pia Alonzo Wurtzbach of the Philippines is Miss Universe 2015. 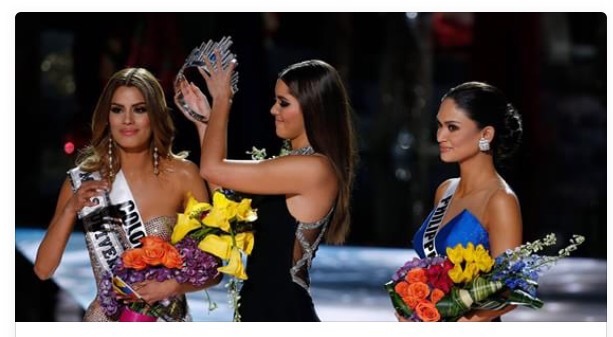 Host Steve Harvey owned up to his mistake and showed the card containing the Philippines as the true victor. I have to pinch him hard for taking away a most genuine image of our Queen getting the crown from Paulina Vega. But I can take the twists. If there is one spot I wouldn’t want to fill in now is that of real 1st Runner-Up Ariadna Gutierrez because she is the one who had to go through an embarrassing minute or two on worldwide TV as having to give up what was already planted on her head and step down accordingly. If it’s any consolation, the Philippines was hastily announced right before the Live Telecast was cut short because of the awkward scenes happening onstage. Sunday Senti Specials: I will miss you, Intercontinental Manila! Posted in: 1 Pageant Pages, 2 Shout-out-Looks. Tagged: Gloria Diaz, Hotel Intercontinental Manila, Miss Universe 1969. 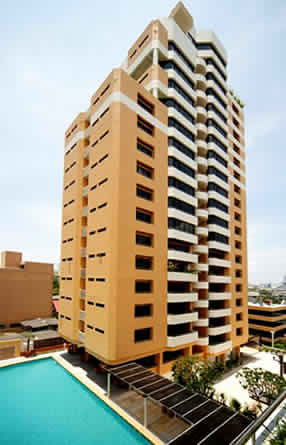 Hotel Intercontinental Manila is one of the most iconic hotel structures in the Philippines. It is, in fact, the oldest standing hotel from a global chain in the country. And here, I have so many wonderful memories, both personal and pageant-related. 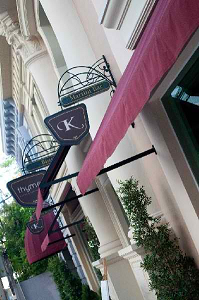 This is where I celebrated a few important milestones in my life, like when I turned 25 and 50. This is also where family members marked theirs. And some people ask why we always find ourselves going back to Hotel Intercontinental Manila. It’s the people, the service, the warmth and the all around shower of unending greetings from everyone. It’s like a halfway home when going to the south of Manila becomes a tricky traffic and typhoon proposition.